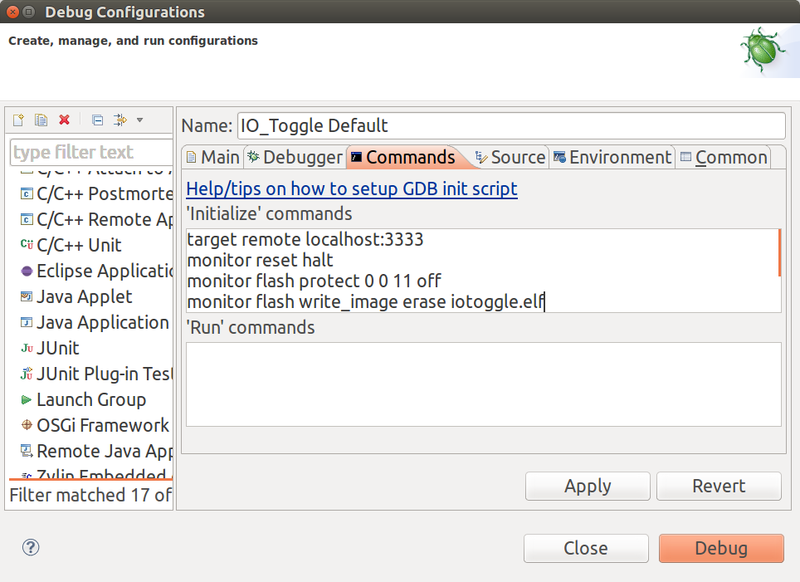 In this tutorial I describe how to configure STM32F4 in-circuit debugging environment using open source tools like GDB or Eclipse. This tutorial is based on the Template Project with Generic Makefile. Complete the Template Project with Generic Makefile. Install Eclipse CDT and some OpenOCD build dependencies via apt-get. Check your current version of OpenOCD. If your package version is less than 0.9.0, then I recommend you to build the program the from the source in 7 very simple steps as follows (due to some issues with STM32F4). Now, build the project with debug configuration instead of release. It will add additional debug information. Or you use a graphical front-end it, for example Eclipse. The first is easier to set up, but more difficult to use and vice versa. Open two consoles (2x Ctrl+Alt+T). Use the first console to start OpenOCD, which connects to the STM32F4 Discovery board and provides GDB server interface at localhost:3333. -c "init" -c "reset halt"
# -c "init" -c "reset halt"
Use the second console to navigate to the IO Toggle project directory. Start the GDB client. First, you’ll connect to the localhost:3333 GDB server. Second, you’ll program the STM32F4 device via GDB. Finally, you’ll use in-circuit debugger. (gdb) monitor flash write_image erase "/complete/absolute/path/to/iotoggle.elf"
Open up a console (Ctrl+Alt+T). Start OpenOCD program to connect to the STM32F4 Discovery board. The command resets the processor and halts its execution. Furthermore, it starts GDB server available at localhost:3333. 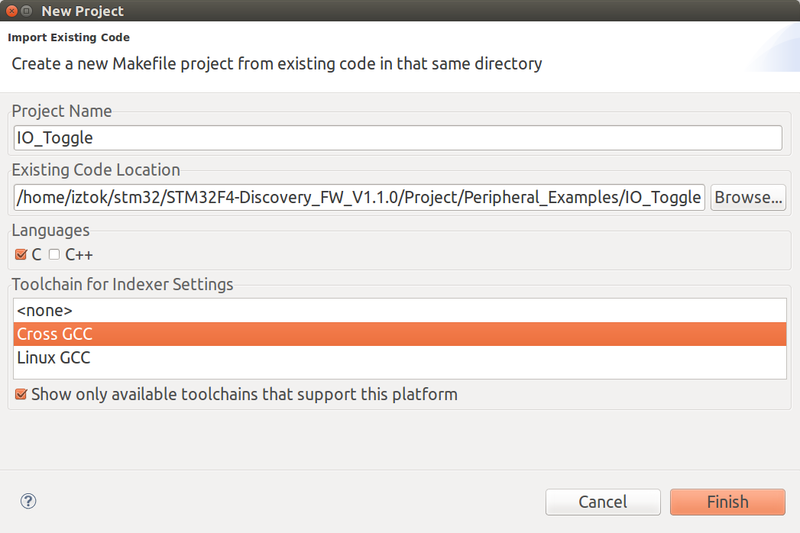 Start Eclipse and create a new Makefile project with existing code (File->New->Makefile Project with Existing Code). According to the figure below navigate to existing IO Toggle project location, uncheck C++ language and select Cross GCC toolchain. The Makefile already includes standard build configuration that are supported by Eclipse out of the box. You can build and clean the project by Project->Build All and Project->Clean, respectively. These two invoke “make all” and “make clean” commands. 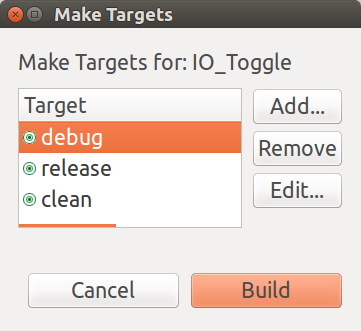 To invoke “make debug” command create a custom make target by pressing Shift+F9 and add a new target names with title “debug”, “release” and “clean”. Now, press Shift+F9 and invoke “clean” and then “debug”. 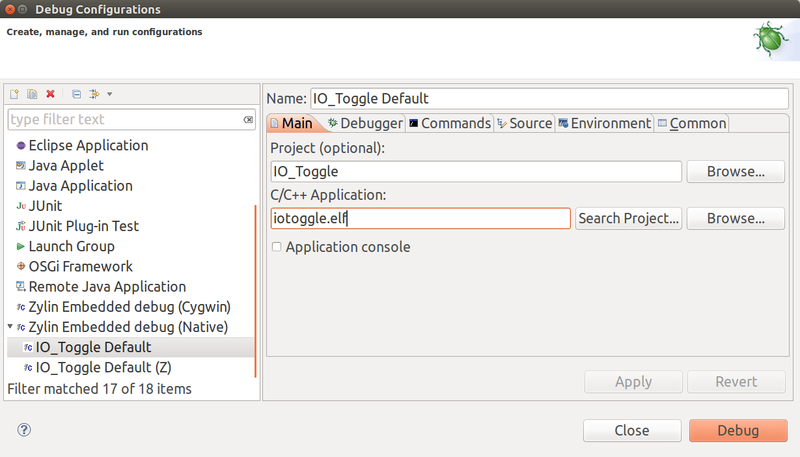 The Eclipse should build the IO Toggle project with debug configuration instead of release. Trust me, it’s easier to use this plug-in than wrestle with default Eclipse debug configuration wizard, because it allows custom GDB commands to be used at debug session initialization. 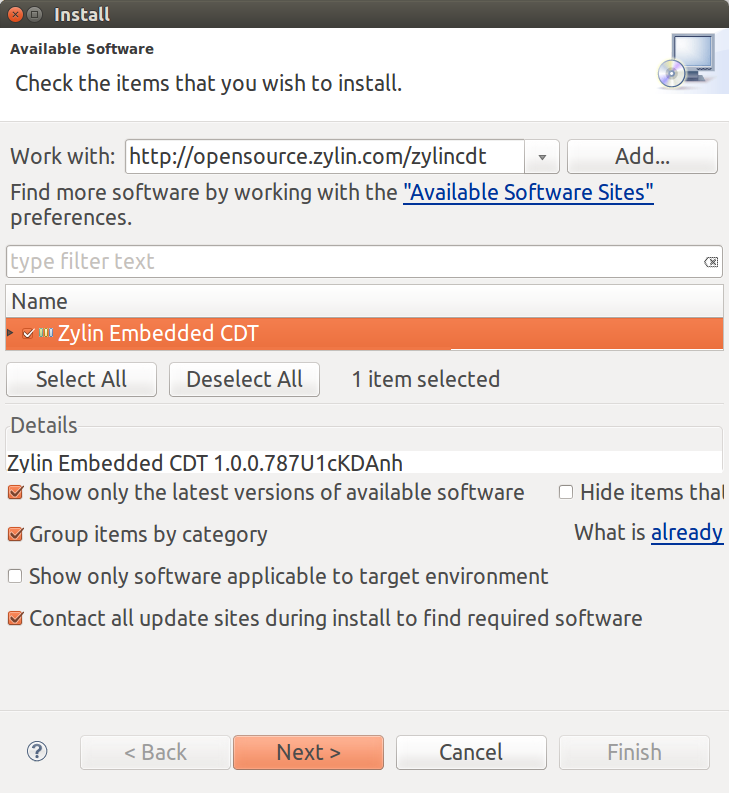 To install the plug-in run Help->Install New Software… Then add the following repository http://opensource.zylin.com/zylincdt (see the figure below). Setup debug configuration by running Run->Debug Configurations… Next, create a new Zylin Embedded Debug (Native) configuration. In the Main tab add “iotoggle.elf” application. In the Debugger tab (Main subtab) replace gdb-elf-arm with arm-none-eabi-gdb. Copy & paste the script below into the GDB Initialization Commands section (see the figure below). The script is based on the command-line initialization procedure from section 4.1. 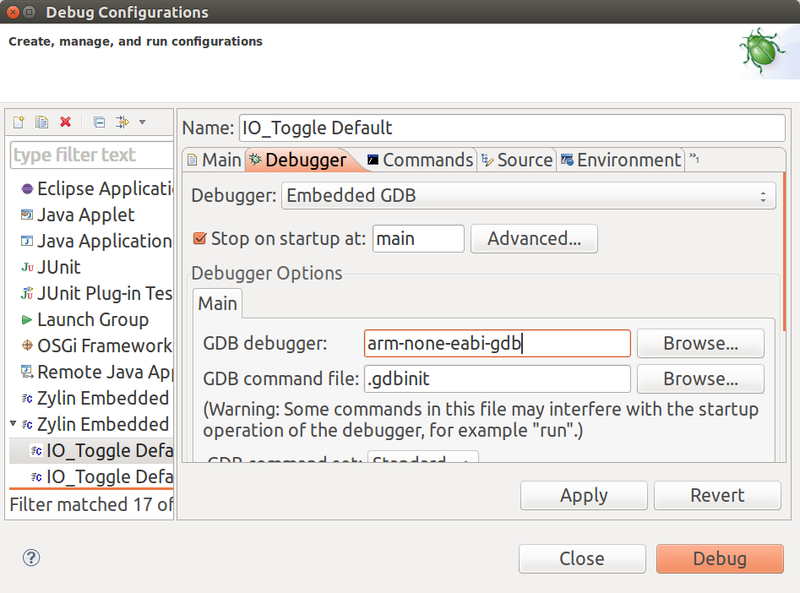 Run->Debug Configurations…., select IO Toggle Default and start debugging! 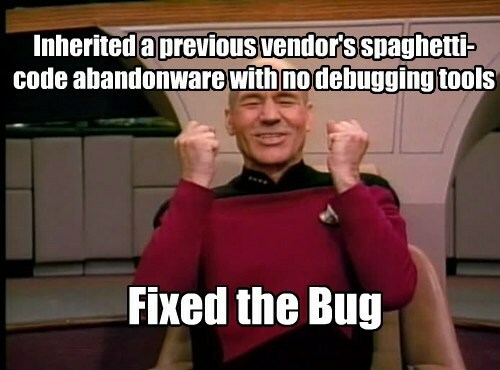 No hurry now, take your time and play with the debugger. Click F6 to step over the source. Create a hardware breakpoint at main.c:70. Resume execution F8. Observe toggling LEDs and how processors stop at main.c:70 again. You’ll notice that Eclipse IDE has some unresolved inclusions. Certain code section are underlined red, even though the code builds correctly. Why? Eclipse is missing appropriate header files. Let’s add them via Project->Properties->C/C++ General->Paths and Symbols. Select GNU C and click Add->File system. 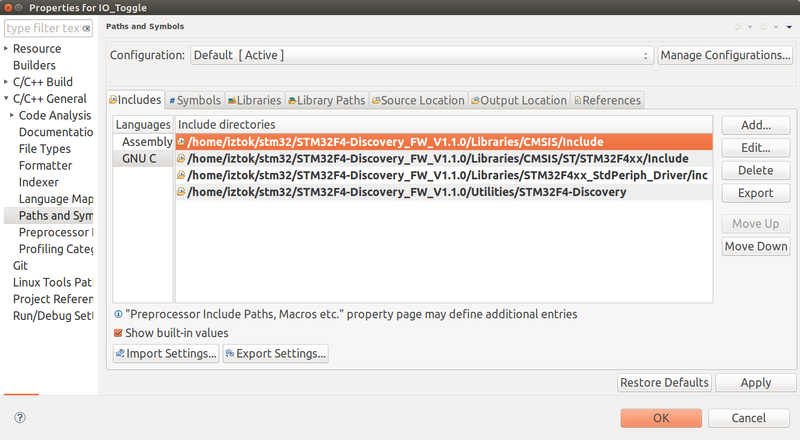 Now, add include directories from the Makefile (see the figure below). The index should rebuild automatically and syntactic error warnings should disappears. Now, you can jump to data structure definitions using F3 key or use autocomplete. Check out In-circuit Debugging [revisited] tutorial, which is easier to setup, easier to use and is based on a newer version of Eclipse. 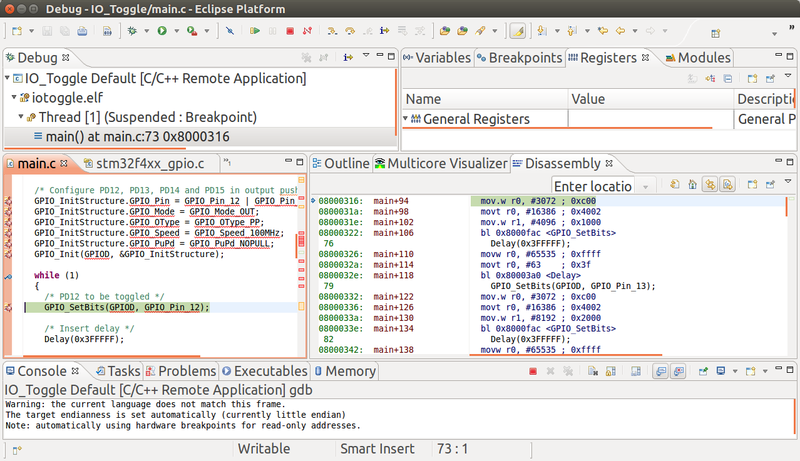 This tutorial is based on Benjamin’s robotics blog on “Debugging the STM32F4 using openocd, gdb and Eclipse“. The capt. Piccard meme is from is from cheezburger.com. This entry was posted in Embedded Systems, STM32F4 and tagged ARM, Embedded Systems, In-circuit Debugging, Open Source, Toolchain. Bookmark the permalink. I was following your tutorial and I got an error. I wanted to initialize gdb on eclipse. “monitor” command not supported by this target. I am on ubuntu. Everything so far worked well. I managed to add libraries later on too.